THEATRIM Advanced Thermolipolytic & Focal Catalyst. RATIONALE FOR CREATION: The weight loss/thermogenic category has been stagnant and lacking ingenuity for quite some time. With an overwhelming percentage of our population being overweight, and an even larger percentage whom would still like to shed a few pounds, the case should be quite the contrary. Compound this with the fact that it boasts one of the industry’s largest market categories by consumer demand, and you can see the clear need for attention and innovation. We are proud and excited to be the world’s first company to introduce TeaCrine, a nature-identical compound proven to enhance psychometric indices of energy, focus and endurance. We’ve combined it with a research-drenched supporting cast of other materials designed to increase energy, overall sense of well-being, thermogenesis, and stored fat utilization through strategic neurochemical pathway manipulation. Best of all, consumers are less likely to develop a tolerance as with other energy and weight loss products. Through its flagship ingredient, TeaCrine, Purus Labs TheaTrim is uses ingenuity and innovation in its approach to weight loss and energy stimulation. Through identifying, focusing on, and addressing specific neurochemical pathways, TheaTrim is a synergistic force specifically aimed at the multiple parameters surrounding weight loss. As a unique aside, due to its specific formulation, consumers are less likely to develop a tolerance as well. TeaCrine (theacrine) is a nature-identical compound found in certain botanical sources that has been shown to act on dopaminergic, adenosinergic and other neurochemical pathways that make it uniquely different than caffeine. By strategically and favorably manipulating these pathways, Purus Labs TheaTrim supports enhanced energy, improved concentration, and reductions in fatigue. Although structurally similar to caffeine, preliminary evidence suggests less tendency for tolerance or habituation; therefore, your body is less likely become desensitized over time. Dicaffeine malate & Caffeine anhydrous are also included for the famed effects on alertness, energy, and appetite suppression. Included for methyl group metabolism and tri-monoamine modulation; in other words, they help support an overall better sense of well-being through neurochemical involvement with norepinephrine, dopamine and serotonin. Specifically included for CYP450 inhibition, an endogenous protein designed to oxidize (break down) certain substances such as caffeine. By blunting this, we can increase and extend the active life of these molecules. Salicin acts to support healthy inflammation management, promotes healthy blood flow allowing for more rapid circulation and delivery of paired compounds. Salicylate compounds and caffeine have long been used in conjunction due to their synergistic nature. Added precisely for alpha-2 adrenergic receptor antagonism. Activation of Alpha-2 adrenergic receptors, as opposed to beta adrenergic receptors, inhibit weight loss. If we can antagonize the alpha-2 receptors, while simultaneously stimulating the beta receptors, we create an ideal scenario for fat mobilization and weight loss. What's In Purus Labs TheaTrim? In order to assess personal tolerance, begin by taking on serving (one capsule) of Purus Labs TheaTrim with your first meal of the day. If tolerance permits, take an additional serving (one capsule) 4-6 hours after your previous use. Do not exceed four servings of Purus Labs TheaTrim per day. Do not use TheaTrim within four hours of bedtime. DO NOT TAKE THEATRIM IN EXCESS OF ITS RECOMMENDED DOSAGE. Theatrim is intended only for healthy adults over 21 and may acutely elevate blood pressure and heart rate. Consult a licensed healthcare practitioner before use. Do not use if you are currently pregnant or nursing, have had or have a family history of heart disease, high blood pressure, stroke or any other disease, or using an MAOI, prescription drug, order over-the-counter drug, particularly for any cold and sinus. If you are a competitive athlete and/or subject to drug testing, consult with your sanctioning body prior to use to ensure compliance. Discontinue use immediately if you experience any adverse reactions. Store in a cool, dry area away from direct sunlight. 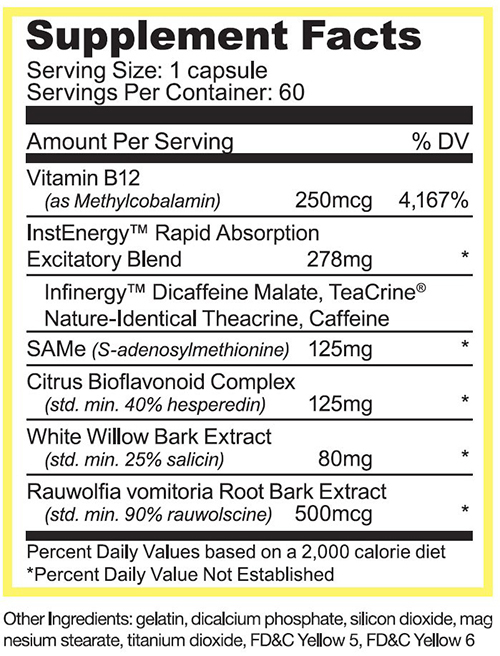 TheaTrim contains 150mg caffeine per serving. Keep out of reach of children. Dont take it to close to bedtime Review by Billy G.
Wait a 6 weeks before jumping to two pills. Review by Chris S.
We have a large selection of in-stock Purus Labs products including Purus Labs items and others for the lowest prices at SameDaySupplements.com® It's always easy to shop for TheaTrim By Purus Labs, Thermogenic 60 Caps at SameDaySupplements.com because you can browse by reviews, brand, prices or search for specific ingredients using our search tool. In-stock orders placed before 3pm EST ship out the same day to USA, Brazil, United Kingdom, Canada, Germany, Australia, Japan, India, France and worldwide at the cheapest prices online.